First, let me gush about the film a little, because totally awesome as it was to have the players there, and to shake Phil Niekro’s hand and tell him I played women’s hardball and thank him for the Silver Bullets, the film itself is so superlative that it was still the best thing of the night. If you love baseball, if you love underdog stories, if you love the drama that can only come from sports, you will love this film. Forget “American Idol” and “Survivor,” sports is the original “reality TV” and this movie, which follows Tim Wakefield and R.A. Dickey through the 2011 season, has all the excitement and heart-rending moments of a good film. Not just a good documentary, a good film. It’s hard to avoid cliches, but when I say “captivating” I mean you will be completely caught up in the stories of these men who do one of the most difficult and most distrusted things in baseball. The music (by Paul Brill) is particularly terrific, and ties together the elements, the slo-mo montages, the interviews, the historical footage. The whole flows so seamlessly it’s actually difficult to express in lay terms how well-made a film it is. You just drink it in through your eyes. And it is incredible to see on a big screen. Yes, you can buy it on iTunes, but it’s at the Coolidge Corner in Boston now, and if you are within driving distance of Boston (or can get to the T) I urge you to go. Here, just watch the trailer, and then I’ll tell you about the ballplayers and the Dickey-look-alike and the chili dogs and what Fenway Park is like on a deserted, windy September night. Okay. So just before the film started, I went to the ladies room, and saw that they had all the ballplayers sequestered in a kind of green room for the event. Then I realized the green room was the theater’s “birthday party room” which meant that Phil Niekro and Tim Wakefield were standing there next to seven-foot high statues of The Chipmunks. It was just… funny. Back in the theater, Bob Lobel and Tim Estilos (a local newspaper film critic) introduced themselves as the emcees for the night. The ballplayers and their families came in and climbed up to the back of the stadium-seating theater, and huh, there was a guy with them who really looked like R.A. Dickey! My immediate thought: is Dickey on the DL? Are the Mets off tonight? What? The guy had a camera around his neck and wasn’t acting like a ballplayer. But then again, part of the point of the film is that knuckleballers aren’t exactly conformists. After the film they had people line up to ask questions. I wanted to ask the filmmakers how they integrated the historical footage so perfectly with the brand new footage they just shot. They had shots, for example, of Wakefield in the locker room after giving up the soul-crushing ALCS-ending walk-off home run to Aaron Boone. Where did those come from (MLB archives?) and how did they make them look so good? But I decided to stay in my seat and let other people do the asking. The very first guy in line was a middle-aged fellow, with a glove in one hand and a ball in the other, and his question was a technique one: “When you throw the knuckleball is the ball flat against your palm or are you holding it out from your palm with your fingers?” All four knuckleballers agreed it was flat against the palm. This was great news to the guy, who I expect will be baffling batters in the Men’s Senior Baseball League next year. There were lots of kids, too, some of whom appeared to have been sent up on line by their parents, but what the heck, it was a great excuse to stay out late on a school night. One kid probably doesn’t remember the question he asked as well as he remembers the high five from Tim Wakefield. I won’t recreate all the questions here. For a lot of it, you just had to be there. After the Q&A was over, VIPs and those with special tickets headed over to the Royal Rooters Room at Fenway. I had never been in the Royal Rooters Room, and in fact I couldn’t even picture where it was. Once we got up there it was clear that once upon a time it had been a back corner of the park or something, but now it has been redone into part memorabilia showcase, part party room. They had both (both! sorry, couldn’t resist…) World Series trophies out on tables where folks could ogle them and take photos with them, and a whole diorama of Tim Wakefield Stuff. There was a windstorm that night, as if a hurricane were threatening, with a low sky and high humidity, but the rain just wouldn’t come. The wind made the concourses of Fenway Park seem even more deserted. I couldn’t help but think how desolate it felt, as if the Red Sox season were actually over, and not merely mathematically over. The one guy I wanted to chat up a bit at the reception was Tony Masseroti, actually, because I’d met him before in the Fenway press box, back when he was still writing for the newspapers, but he basically power-schmoozed nonstop all night. It was much easier to talk to knuckleballers Hough and Niekro. 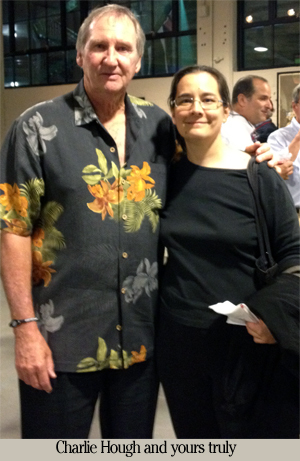 As I mentioned above, I talked to Niekro a little about women’s baseball. He said he was surprised no one would pick up the sponsorship of the Silver Bullets after the beer company decided to go another direction. 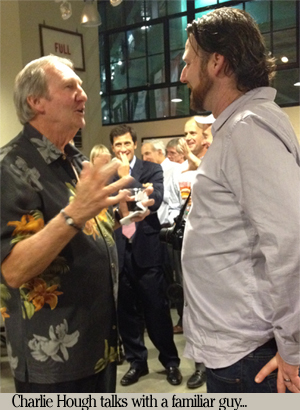 As I told him, women’s baseball is growing by leaps and bounds everywhere in the world… except the USA. These kind of receptions always have a certain feng shui about them. The energy flows in certain directions and gets blocked in certain directions. 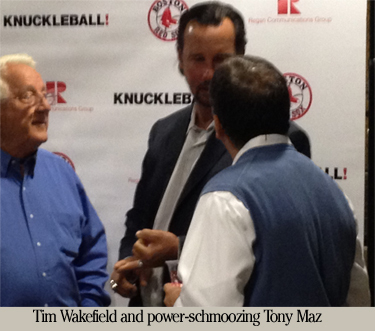 The energy here flowed toward the Knuckleball/Red Sox backdrop they had set up for photos, in front of which Wakefield and Masseroti stood for most of the night. I don’t blame Tony Maz for soaking it up. He was probably the most quoted non-player in the movie and it’s not every day the beat-writer or media grunt gets the spotlight on him. (I know he has a radio show: trust me, radio is not a glamour gig.) People would eventually circulate away from the open bar and the chili dog buffet and the gourmet pizza toward the photo area and try to get some handshakes in here or there, some autographs. Over and over I saw the young guy who looked so much like RA Dickey–same haircut, beard, nose, skin tone–get approached by people who couldn’t believe it wasn’t him. Eventually I gave up trying to talk to Tony Maz and I gave in and asked the guy what his name was, “so I don’t have to refer to you the whole blog entry as ‘RA-lookalike-guy.” My guess up to that point from having watched him interact with the families was maybe he was someone’s son-in-law. “Oh, I’m Aaron Hough, Charlie’s son,” he said. “Aaron like Hank Aaron. Only I didn’t hit like him.” Charlie overheard that and just gave me a chagrined shrug. Can’t blame a guy for trying. Dang. I should’ve asked Aaron if he ever threw the knuckleball. This was written by Cecilia Tan. Posted on Saturday, September 22, 2012, at 1:26 am. Filed under Baseball Fans and Fandom, Baseball History. Tagged boston red sox, charlie hough, fenway park, knuckleball, movie, new york mets, phil niekro, r.a. dickey, tim wakefield, wilbur wood. Bookmark the permalink. Follow comments here with the RSS feed. Post a comment or leave a trackback.